Date et lieu du colloque: 14-16 avril 2016, Pays-Bas, ’s Hertogenbosch. To commemorate the death of Jheronimus Bosch in 1516, the city of ’s Hertogenbosch will organize a wide range of events in 2016. One of the highlights of the Jheronimus Bosch Year will be the exhibition Jheronimus Bosch – Visions of a genius at Het Noordbrabants Museum, which will run from 12 February to 8 May 2016. By that time, the Bosch Research and Conservation Project will have published its new, two-volume monograph, which will be the outcome of over six years of research on one of the most creative and enigmatic artists of all times. In conjunction with the exhibition and the publication of the new monograph, the international conference Jheronimus Bosch: His Life and His Work will be organized by the Jheronimus Bosch Art Center and the Bosch Research and Conservation Project. For this meeting, we invite proposals for 25-minute presentations on any aspect of Bosch studies. Please send your one-page proposal and a brief CV before September 1, 2015, to: spronkr@queensu.ca and hg@jheronimusbosch-artcenter.nl. Conference Committee: Prof. Dr. Ron Spronk (chair), Prof. Dr. Jos Koldeweij, Dr. Eric De Bruyn, Dr. Matthijs Ilsink, Hannah Gooiker, M.A. (administrative support). The conference Jheronimus Bosch: His Life and His Work will be supported by the Jheronimus Bosch Art Center, the Foundation Jheronimus Bosch 500, the City of ’s Hertogenbosch, Het Noordbrabants Museum, and Radboud University Nijmegen. 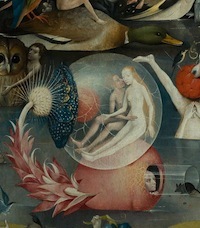 Jheronimus Bosch: His Life and His Work will be the fourth international conference organized at the Jheronimus Bosch Art Center (JBAC), after Jheronimus Bosch Revealed: The Painter and His World (2001); Jheronimus Bosch: His Sources (2007); and Jheronimus Bosch: His Patrons and His Public (2012). The JBAC is a study- and documentation center for the works and the world of Bosch for both specialists and a more general public. In the JBAC, reproductions of the entire oeuvre are on display in 1:1 scale.